As I mentioned in my day before prep, I did not do enough planning to ensure that things actually went smoothly on the day of our Friendsgiving. 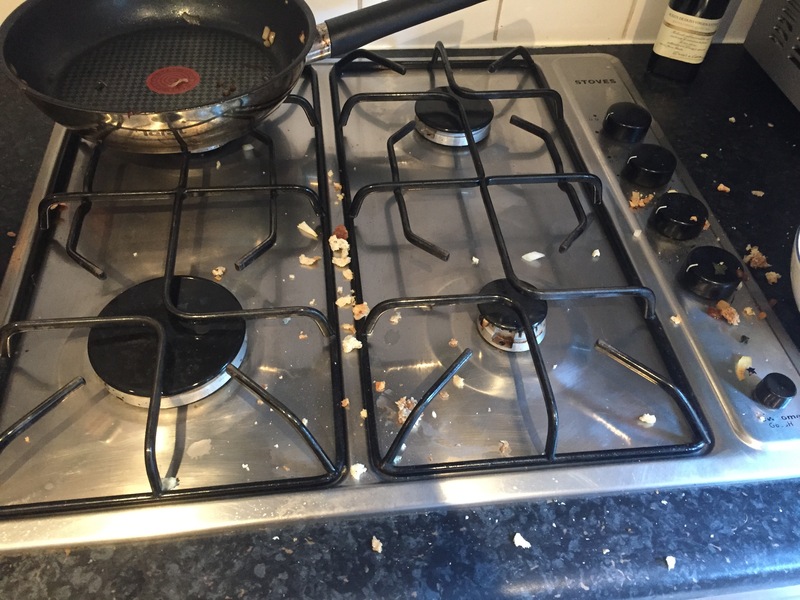 In fact, I did not plan the timings of the cooking at all, which proved to be a very stress-inducing mistake. Sean and I ordered our turkey from Whole Foods. We also delegated most of the dishes by making our dinner a pot luck. We literally only had to make three dishes and I was still a stressful mess. I joked that Friendsgiving would be impossible because we only have one oven, but counter space ended up being the real issue! Sean and I both come from houses with massive islands in the kitchen and plenty more counter space along the sides; in our house, we have literally one sliver of space that we have to use for all cutting, mixing, and storing during the cooking process. It resulted in a huge mess. While Sean ran out to do some necessary errands (pick up the turkey), I was stuck at home alone with the cooking. I started on the stuffing, thinking it would take the longest, but being the overeager hostess I am, got started without reading the directions in full. I had to scramble to chop the onion and make the broth while trying not to burn the bacon that was frying on the stove.To say I was frustrated would be a massive understatement. When I finally got the stuffing in the oven, I was so relieved! When Hope arrived, we broke out the wine. She took over the kitchen while I set the table and prepared the house. I was so happy that I ended up loving the centerpiece, and the plastic/paper table settings ended up looking pretty nice! We didn’t struggle for oven space until we had to heat up the turkey. Whole Foods gave it to us completely cold, so we had to put it back in the oven to reheat. While the turkey was in the oven, everybody started arriving with all of the other stuff that needed to be reheated. We tried to entertain everyone with appetizers and cocktails until the food was reheated and the turkey carved. Sean concentrated so much on carving the turkey and it ended up turning out so well (thanks YouTube!). We all sat down, shared what we were thankful for, and dug in. It was so nice having so many people crammed into our living room (never thought we would be able to make that work) laughing and getting to know each other. Also – who knew we had so many friends!? We went through five or six bottles of wine, a couple bottles of prosecco, sixteen whiskey cocktails, and a bottle of the mamajuana drink we were gifted in the Dominican Republic. We were all quite jolly! I still think that Sean secretly hoped our dinner would fail so I wouldn’t be tempted to host more, but it was such a great time. So here’s to many many more! I intended to do a lot to plan Friendsgiving this past weekend, but did not get out of bed on Saturday, which really did not help the whole process. However, I did manage to get some things done which will hopefully help get everything prepared next week! “American food” is hard to find in London. Basic Thanksgiving things such as canned pumpkin and fried onions are not so easy to come by in normal grocery stores. Thankfully, Partridges has a little Thanksgiving section in the front of the store which has it all. I stopped there over the weekend to get the important ingredients (and the things I am not 100% sure I can find elsewhere) so we do not have any emergency food runs over the weekend. I have been trying to find items to help create a fall-themed centrepiece for awhile no, with little luck. I ordered some acorns from Amazon, but cannot find the other items I need. While I picked up the table runner, tablecloths, and napkins this weekend, I still do not have the rest of the centrepiece. I’m weighing this one as extremely important since it will bring nice life to our folding tables, so have become quite stressed. Who knows – I might end up picking sticks and leaves up outside and including them! I stopped at Peter Jones to pick up the table runner and a few other things, and obviously got sidetracked and bought other things I did not need. Specifically, a polar bear mug (see below). I couldn’t resist…I mean look at that thing! This is the prep that I completely failed at this weekend. I did some laundry, and washed all the dishes, but could not be bothered to do a full deep clean. The house needs a good sweep and wipe down before we have fourteen people over, so I need to prioritize that this week. Sean and I are so eager to host Friendsgiving at our new house. While we just had the wine tasting, this will be our first event with so many people, and we know we are going to struggle for space. However, being the typical American that I am, I refuse to miss out on the feast this year (Sean loves it just as much!) and we have plenty of English friends who are looking forward to finding out what all of the fuss is about. Due to work schedules, we settled on 22 November as the date for our Friendsgiving, at the typical Thanksgiving meal time of about 3pm. If it’s not a Thursday, we figured Sunday would be the next option…at least American football will still be on! We will be having twelve of our friends over, over half of which have never experienced Thanksgiving. Therefore, in order to maintain America’s incredible reputation, I’m really stressing about this being a fantastic event! I’ve broken my planning and errand running down in three stages: Advance, One Week Before, and The Day Before. I figured I would post about each of these stages on here (as well as the final product) for any future Friendsgiving planners! The Advance Planning has definitely been stressful, but I have finally solidified everything…yippee! Since we are having so many people and have such a small kitchen to prepare stuff in, we decided on a potluck style dinner. The menu was therefore the easiest part, but needed to be announced ahead of time so everybody could call dibs. Sean and I are taking care of the turkey, stuffing, green bean casserole, and pumpkin pie (realistically some brie as well, but that’s just a given). We’ve asked our friends to provide the rest: mashed potatoes and gravy, cranberry sauce, mac and cheese, sweet potato casserole, etc. We settled on the basics simply because it is so many peoples first “Thanksgiving” that it needs to be a classic (and easy) as possible. However, everybody is already planning on their own twist on their dishes, so I’m excited to see the final product! I’m going to admit this ahead of time so nobody is surprised or disappointed down the line – Sean and I are cheating. Not on each other, but on Thanksgiving. As in having the Turkey made for us (cue the gasps). I promise this is justified, though! First of all, he’s never made a Turkey and nobody could live up to my dads. Second, there’s the small oven issue. We’re serving 14 people, which means we need a big turkey. I didn’t want to go out and buy one to come home and find out it didn’t fit in the oven. Third, my dad offered to cover the turkey for us this year since I was so stressed about it. This means that we could actually afford to have the turkey made for us, and the ones from Whole Foods just look delicious. So that’s the situation – we will be picking up a turkey on the morning of Friendsgiving and serving it as if it were our own (don’t worry I won’t actually take credit). This has definitely been the trickiest part of planning our meal considering our house lacks a dining room table. I’ve searched for hire companies who would be able to get me tables and chairs, but they were coming back too expensive for just one day. Thankfully, I found 12 folding chairs down in one of my offices and one of my coworkers offered me his two folding tables. I pulled out my tape measure yesterday and think it will all fit so everybody will have a seat at Friendsgiving. Now that’s something to be thankful for! The Amazon order was fun. We’re talking attractive paper plates, plastic wine glasses (which are surprisingly nice), and bits and bobs which will be part of the centerpiece. I felt extremely satisfied when I pressed the order button, knowing everything would get here on time as well…except everything was shipped individually. We are now dealing with what feels like a hundred “missed delivery” slips and will have to do a mix of running to the post office and tracking down couriers. At least Sean has the day off tomorrow and can deal with all of this for me. Another thing to be thankful for! Once all of the Amazon orders have been collected, we will be able to tick off all of the advance planning and will be one step closer to a successful Friendsgiving.